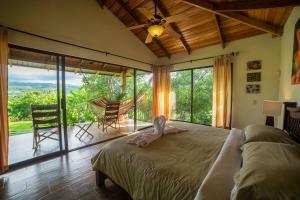 ﻿ Best Price on Catarata Eco Lodge in La Fortuna + Reviews! Offering an outdoor pool and an à la carte, tropical-style restaurant, Catarata Eco Lodge is a proerty located in Fortuna, Costa Rica that features stunning views of Arenal Volcano. Free Wi-Fi access is available. The elegantly decorated rooms with tropical style details offer a private bathroom with shower. They all have ceiling fans. The on-site restaurant is specialized in characteristic local cuisine from Costa Rica. Catarata Eco Lodge also has a tropical garden. The property offers free parking and laundry services. La Fortuna Waterfalls is 1.2 mi from the property, and 2.2 mi away is located an area with hot springs. Fortuna town center can be reached in a 5-minute drive. Juan Santamaría International Airport is 2 hours and 30 minutes' drive away.